A fresh salad that's perfect for lunch or a dinner side. 1. 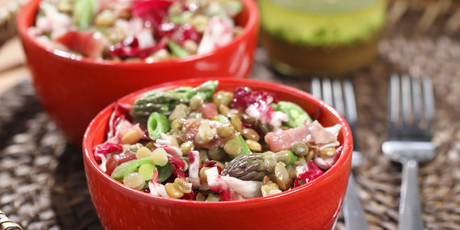 Toss all ingredients asparagus, radicchio, lentils, snow peas, and prosciutto in a medium bowl. 2. For the dressing: in a separate bowl whisk the vinegar, mustard, chives, and honey together. Slowly pour the oil in while whisking. Season the dressing with salt and pepper to taste. 3. Toss the salad with the dressing and serve!